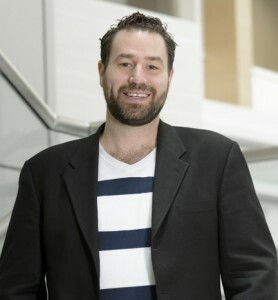 The Canadian Association for Neuroscience (CAN) is proud to announce that Matthew Hill, from the Hotchkiss Brain Institute at the University of Calgary, will be awarded the 2016 CAN Young Investigator Award at the upcoming 10th Annual Canadian Neuroscience Meeting in Toronto, on May 31st 2016. Dr. Matthew Hill’s research has deepened our understanding of how the brain responds and adapts, or fails to adapt, to stress. His research has helped demonstrate the important role of the endocannabinoid system in buffering stress response and regulating emotional response in the brain. His pioneering work with rodents has demonstrated that exposure to chronic stress results in a collapse of the endocannabinoid system. He also showed that enhancing the endocannabinoid system produced behavioral changes suggesting reduced anxiety and active coping responses to stress, and that conventional antidepressants use the endocannabinoid system to dampen activation of the stress response. This body of work has led to the hypothesis that deficient endocannabinoid signaling may be an underlying cause of stress-related psychiatric conditions such as depression and posttraumatic stress disorder, or PTSD. In addition to showing that endocannabinoids regulate stress, Dr. Hill has worked to elucidate the mechanisms through which they act. In a series of highly-cited publications he showed that endocannabinoid signaling can prevent the activation of the stress response, that stress hormones recruit endocannabinoids to terminate the stress response, and that endocannabinoid signaling is required to modulate the excitability of stress circuits, thereby contributing to the ability of the brain to adapt to repeated exposure to stress. His current work focuses on understanding how chronic stress hinders endocannabinoid signalling to generate pathological anxiety. The insight Dr. Hill has gained through research done with animals has prompted him to collaborate with clinicians to investigate the role of endocannabinoids in humans. This work has shown that the endocannabinoid system regulates stress response in humans and that this system is defective in individuals suffering from major depression or PTSD. This research has led to the exploration of new therapeutic avenues, investigating the potential of endocannabinoids for the treatment of these psychiatric illnesses. Matthew Hill’s productivity, both in terms number and quality of scientific publications, is impressive. He has published in top journals in the field such as the Journal of the American Medical Association (JAMA), Nature, Nature Neuroscience, Neuron, the Journal of Neuroscience and Molecular Psychiatry. His expertise and originality are well-recognized, as he has been invited to present his findings over 50 times in the last five years, at numerous international conferences and as an invited speaker at Universities and research institutes across Canada and the USA, including McGill University, Columbia University, Emory University and the National Institutes of Health. He has also been invited to speak in Europe, including at the Max Planck Institute of Psychiatry in Munich Germany, and the University of Groningen in the Netherlands. Dr. Hill’s research has also been highlighted in many media outlets, including the New York Times, Scientific American and CBC radio. Dr. Matthew Hill is one of the few early career investigators to have received a CIHR Foundation grant. Dr. Hill has demonstrated his leadership in the field of cannabinoid research as Past-President of the Canadian Consortium for the Investigation of Cannabinoids, and President-elect of the International Cannabinoid Research Society. Dr. Hill’s leadership in research, the originality and quality of his work, and the impressive level of recognition he has gathered internationally make him stand out as an exceptional young neuroscientist. The Canadian Association for Neuroscience is very proud to present Dr. Hill with the 2016 CAN Young Investigator Award. Calgary’s Top 40 under 40 (2014) Read about Dr. Hill’s nomination in Calgary’s list of top 40 for Matthew Hill’s research into the endocannabinoid system has changed our understanding of how the brain deals with and recovers from stress.